- Luxury Rating By Andrew Harper; the most respected voice in luxury travel. - This property comes with 6 dedicated parking spots. DETAILS: Your perfect Florida getaway is “A Shore Thing” when you stay at 55 Sunfish Street. The first floor of this home offers the perfect setup for younger guests with a variety of bunk arrangements. The bunk room is equipped with two queen-over-queen built-in bunk beds and one twin-over-twin bunk bed. One set of queen-over-queen built-in bunks await in the bunk nook, and all guests in these areas will enjoy the mounted flat-screen television in each bunk and a bathroom with a glass-front shower and a dual-sink vanity. The spacious first-floor master bedroom boasts a king bed and private bathroom with a shower. In the game room, guests will enjoy the pool table, foosball table, half bathroom, and multiple mounted flat-screen televisions. The crown jewel of this home is the incredible outdoor oasis, which features a large private pool and a swim-up bar, ample pool deck chaise lounge chairs, an outdoor kitchen, and a large outdoor flat-screen television. The expansive, open floorplan makes the second floor a perfect gathering place. Stunning hardwood floors and cheery coastal décor create a relaxing ambiance, and transom windows throughout allow natural light to brighten the space. The spacious kitchen is a home cook’s delight and features bright white custom cabinetry, premium stainless steel appliances—including two dishwashers—and a top-of-the-line gas range. Ample seating at the nearby dining table and breakfast bar creates the perfect place to enjoy family meals. Plush furnishings and a large flat-screen television await in the living room, and guests can relax with a stunning outdoor view. Pocket sliding glass doors lead to the spacious and well-furnished second-floor balcony. Also on this floor are two stunning king bed guestrooms, each offering light-filled transom windows and a private en suite bathroom with a shower. On the third floor are three incredible guestrooms. The first master bedroom offers a king bed, access to the balcony, and a private en suite bathroom with a shower, a spa tub, and a dual-sink vanity. The second master bedroom boasts a king bed, balcony access, and a private en suite bathroom with a shower. A plush king bed and one twin-over-twin bunk bed await in the guestroom, and guests here can enjoy a private bathroom with a shower and a tub. The spacious third-floor balcony offers ample seating and picturesque views. Weddings are not allowed at this home. If this policy is violated, you may be asked to vacate the property as well as be subject to HOA, community and 360 Blue fines. *Please note: The elevator is not available for guest use. 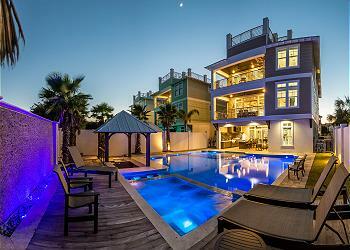 The beach house in Destin was amazing! It helped make our vacation experience the best ever. We are so glad that you enjoyed your stay with us in Destin! Thank you for staying with 360 Blue, we hope to see you again soon! My accommodations was wonderful and the facilities was nice and clean. The decor was awesome. Love it! We had an amazing stay, regardless of Red Tide and Hurricane scare. But gotta give all my applause to Amber Ingram she went above and beyond after hours to get us the UFC fights the first night we were here. She made sure we had everything we needed and that we were safe thru Hurricane Michael and after. We will definitely be booking all our stays Thru 360 Blue. A wonderful group of people. This house is more than we could have ever asked for truly an adventure for all of our kids and grandkids. Thank you all again. We are beyond delighted to hear how much you enjoyed your vacation with us in Destin! We especially loved the photo you shared. We are so glad that your experience with Amber and everyone at 360 Blue was a positive experience and we look forward to helping you for many years to come! My group of 15 had an amazing time at A Shore Thing! The house was huge and accommodating to everyone in our party. The pool could not of been better and the short walk to the beach made it easy to go back and forth throughout the day. The golf cart came in handy for quick trips through the neighborhood and the bikes were enjoyed by a few in our group. A few tips: bring house shoes since the floors get sandy (not the houses fault) we vacuumed almost daily! A few more pots and pans would have been nice, but again it wasn’t a huge deal! We really enjoyed the privacy in this home. The owners/renters truly let you enjoy your time to your selves! The first day was the only time we saw maintenance come out to fix our garage! We also LOVED the sound system, so fun! A little info on how to set it up would of been helpful but a quick phone call to 360 and we were all set! Thanks again for the best stay! We will be back!!! We are so delighted that you enjoyed your vacation with us in Destin! We agree that this home is perfect for large groups and the accommodations are second to none! We will be sure to share your feedback about the home with our team and we look forward to seeing you again soon! We stayed at A Shore Thing, and had 15 people ranging from 14 to 75 years. This house was perfect for us! Everyone had space to breathe & the pool was amazing! We had minor maintenance issues, which were addressed promptly with immediate updates. Checkout was no hassle at all. Comfy beds, wonderful kitchen, nice pool table. This was a wonderful place. We couldn't be more happy that you and your party had such a wonderful vacation in Destin! The home truly is stunning with plenty of room for everyone. We are thrilled we were able to resolve your minor maintenance issues so quickly as well. Thank you for choosing to stay with 360 Blue and we hope to have you back again soon! We had a great time staying at 5 Sunfish. We were celebrating a family reunion and easily were able to host 30 people all in the big house for dinner and swimming the beautiful pool. Highlights of the trip: Bonfire on the beach! A must to and we scheduled this through 360 blue, bunk rooms for kids, beach chairs at the Cabana Club across the road and riding the bikes around town. Great house for big groups! We are so happy to hear how much you and your family enjoyed your vacation with us in Destin! We agree that this home is perfect for large gatherings such as a family reunion and a bonfire on the beach is always a huge hit! We hope to see you all again very soon! Destin was amazing, and the “A Shore Thing” house was fabulous for our family reunion party of 22. Due to the house’s convenient location, we could easily access the beach and the wonderful shops Destin has to offer. The beach’s soft, white sand and the crystal-clear emerald green water are breathtaking sights. The favorite part of the vacation was our parasailing adventure. My daughters loved it and wanted to go back up as soon as they came down. We can’t wait to go back to Destin! We are so glad you and your family enjoyed your vacation! The photo you shared is amazing and truly shows how much fun you all had! We agree that this house has everything and is in a great location. We look forward to hosting you and your family again very soon! This house was tops! We really enjoyed ourselves had a party of 20. Had plenty of room and the amenities were great speakers in every room for music, nice size TV\'s and the pool was AWESOME. The house decor was stunning!!!!! We will book this house for years to come. I love working with 360 blue properties! YOU WILL NOT GO WRONG BOOKING THIS PROPERTY!! We are beyond thrilled that you enjoyed your summer getaway in this beautiful home! It is truly everything you said and more, the perfect beach house. We loved having you with us and we hope to see you back soon! The house was amazing! We had 24 people and had plenty of room for everyone! We came to Destin to celebrate high school graduation for 7 awesome boys!We had some rainy days, and it helped that we had room to spread out and no one felt crowded. The pool and hot tub were perfect and so was the outdoor kitchen area. We cooked most of our meals at the house. The walk across the street to the beach was perfect! I loved that you had a central vacuum which we used a few times to clean all the sand off the floors. This was a great vacation home! We are so delighted to hear how wonderful your vacation was! We agree this home is perfect for large groups and families and the photo you shared shows just how amazing the balcony is! We hope to see you again soon! This property was amazing! There were 8 adults and 10 kids and I still think we had 2 bedrooms that were not utilized. The pool was great and large enough for our crew plus the balconies were fantastic and a great spot to eat dinner and watch sunsets. The beach was a short walk across scenic 98 and not overcrowded at all. We rented beach chairs for the week which was nice to come and go as we pleased. The surrounding neighborhood was a nod to a bygone era, with motels and beautiful homes the norm instead of high-rise condos. I would suggest families coming to the property to bring a lot of wet Swiffer mop products and to consider hiring a cleaning service half-way through your week long stay. The floors hide sand and dirt very well but there were no cleaning supplies to keep the floors and kids feet clean. It really needs a daily scrub through the high traffic areas. Would also recommend to the property management team to provide some level of cleaning supplies and simple items like brooms with dustpans. We are so thrilled that you enjoyed your stay and we appreciate your valuable feedback. We will make sure we put some basics in the home to help keep the sand at bay. We hope to see you back soon! We love this home! Our marriage group consisted of residents from various states such as Texas, Georgia, Wisconsin, Alabama and we were all blown away with the style and comfortable feel and design of this home! We absolutely loved and enjoyed this every part of this home! Hoping that this could be annual location for us. We are delighted that you had a great time here in Destin and decided to go with us for your wedding venue! The picture absolutely shows how much fun you and your guests had! Congratulations to the happy couple! We would love to host you and your loved ones again soon! Unbelievable house. Has everything you would want or need for a nice vacation and very close to the beach. Maintenance guys were great (especially Matt) and we had a great time. Sounds like an amazing week in a truly incredible home. Thank you for choosing 360 Blue for your spring break getaway. We look forward to seeing you back again! We had an excellent Fall Break with 6 families - 12 adults and 15 kids ages 1-8. The house is gorgeous! It was the perfect size and space to fit our group. The kids loved the 2 bunk rooms with their own TVs built into the beds. We all had a great time in the pool and hot tub. The house is an easy walk to the beach and the golf cart was a great way to load up all the beach gear needed for so many kiddos. We would have liked to have a had broom and mop in the kitchen and a higher suction vaccum to help clean up food crumbs and sand each day. There was maintenance in the oven and landscaping and pool cleaning while we were staying. It would have also been nice to have received notice someone would be in the house and pool area ahead of time. Our stay was fantastic and we are already looking forward to doing it again! What a precious photo! It looks like you got to make some fun memories in the home! We are absolutely delighted to hear that you enjoyed the home and your stay with us so much! This home really is perfect for large groups! Thank you so much for choosing 360 Blue and taking time to share your valuable feedback with us! We hope to see you back again soon! Sigma Chi 87 class reunion! We rented "A Shore thing" for my 30th college reunion of my 15 pledge brothers from class of 1987! The house was perfect! Everyone had a great bed! Great kitchen, great patio, grill area and awesome pool! The golf cart was a nice touch for restocking food/booze! Bikes on the beach were fun too! Perfect venue! We lived the built in sound system! Awesome! What a great photo! It sounds like you guys had a perfect reunion! We are delighted to hear you enjoyed your stay with us and the property so thoroughly! The kitchen and patio really are fantastic and perfect for hosting groups! Thank you so much for choosing 360 Blue for such a special trip, and taking a moment to share your experience with us! We hope to see you all back again next year! We had a fabulous time in Destin. We had our family reunion which consists of 26 people. We were very surprised on how beautiful the home was and how spacious it was. All rooms where very comfortable and well equipped. The beds and pillows were very comfortable also. In regards to things that need improvement: more pots and pans, bikes need some TLC, for this caliber of house you should provide beach chairs and umbrella. Also golf cart needs to be looked at. The brake does not work so well and for such a large house you should a larger golf cart Overall the house was wonderful. What a great family photo! We are so happy to hear that you enjoyed your stay with us! Thank you so much for choosing 360 Blue for your family reunion, and thank you for providing us with valuable feedback. We always appreciate suggestions from our guests! Be sure to come visit us again soon! We are so happy you and your family had such a great stay in Destin! The home is so beautiful and has plenty of room. Having a private beach access right to the Cabana Club is such a great perk as well! We do apologize about the pool alarms, but we are happy that we were able to resolve it during your stay. Thank you so much for choosing 360 Blue and we hope to have you back at the beach again soon! Absolutely amazing property! Great location and 360 Blue was wonderful to work with. We will definitely be back!! Thank you so much for staying with 360 Blue! We can't wait to have you back at the beach again soon! 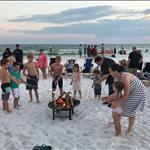 We were a group of three families totaling 27 and enjoyed the pool, beach, and nearby church on Matthew Blvd. We prepared nearly all meals onsite and enjoyed the kitchen and poolside grill. Lots of memories were made by all of us. Our mouths are watering just looking at this picture! We're so pleased to hear that your group enjoyed your stay with us, and that you could take advantage of the poolside grill! Thank you for choosing 360 Blue properties for your beach vacation. Be sure to come see us again soon! We rented 53 and 55 Sunfish. Our group had a great time and the set up was perfect. We had a couple small issues come up during our stay but I have to say that the concierge response was almost immediate. I would definitely rent from them again and recommend these house to large groups. Everything in the houses from beds, pillows, furniture and even kitchenware made you feel comfortable like at home. Absolutely great! We are so thrilled that you had such a wonderful time in these incredible homes. The layout and amenities are perfect for large groups and definitely provide all the comforts of home. We enjoyed having you here with us and hope to see you back soon!